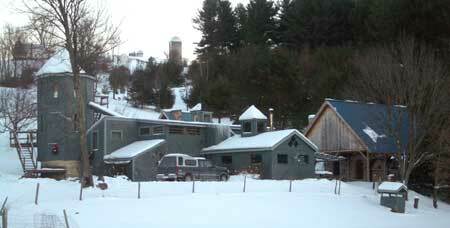 Robert's first pottery studio was in Moretown, Vermont in 1972. The following year he purchased an old farmhouse and barn on Rt. 116 north of Bristol village. He began the transformation of this dilapidated old barn into a working studio. Almost immediately the roof was stabilized and insulation was added to the roof and walls, as well as a gas heater. He refers to the unusual architecture he created as "form following function." Every time he needed the building to meet his current needs, he either added an addition or altered the interior spaces.